The prime areas in Putrajaya City are divided into precincts and consitst of government offices, as well as commercial, residential and recreational areas. Featuring smart building concepts, buildings in the government precinct are equipped with computerised utilities and amenities. Hotel accommodation in the city are rated three to five-star, and offer well-appointed suites, modern conference, banquet as well as recreational facilities. Perdana Putra Perdana Putra houses the main administrative offices of the Prime Minister, Deputy Prime Minister, Ministers and Deputy Ministers in the Prime Minister's Department, Chief Secretary to the Government as well as the Special Units. It features striking green domes and its main block is decorated with stone carvings and wrought iron with motifs of the bunga raya or hibiscus, the national flower. A combination of islamic and Mogul architecture, this majestic structure overlooks the picturesque Lake Putrajaya. Seri Perdana The official residence of the Prime Minister, Seri Perdana comprises the main reception and banquet blocks as well as the residence block-a private home for the Prime Minister and his family. It incorporates Malay and islamic architecture as well as contemporary elements and is attractively landscaped. The building is used for official receptions and banquets as well. Putra Mosque The stately Putra Mosque is one of Putrajaya's most famous landmarks. It has a unique pink dome which is constructed from rose-tinted granite and comprises of a prayer hall, the sahn or courtyard, learming facilities and function rooms. The mosque accommodates 15,000 worshippers and boasts a 116-metre, five-tiered minaret, the tallest in the region. Putrajaya International Convention Centre The design of the convention centre was inspired the traditional pending perak (silver royal belt buckle) and wau bulan (moon kite). It covers a total floor area of about 135,000m2 over nine levels and its Plenary Hall can accommodate approximately 3,000 delegates. Equipped with modern facilities, it has all the required facilities to host international and regional conventions, exhibitions and private functions. Datarn Putra The 300-metre circular Dataran Putra has concentric stars representing the states of Malaysia and is adorned with light and water features. The highlight here is the Chahar Baghs or the recreation of Eden with its four quadrants and four rivers. Serving as a unique transition between the ceremonial area and the parks, the Chahar Baghs is a carefully arranged interplay of paths, water channels, trees and flowerbeds. The Millenium Monument Located on a 25ha park in Precinct 2, it is the first national monument to be built in Putrajaya. A prominent pillar towers above the monument which takes the shape of a hibiscus. It contains a wealth of information on the country's history as well as its achievements. Taman Putra Perdana Taman Putra Perdana is situated at the highest pointing in Precinct 1 and affords visitors a scenic view of Putrajaya. Of particular interest here is Putrajaya Landmark, a unique metal sculpture which is the centrepiece of the park. 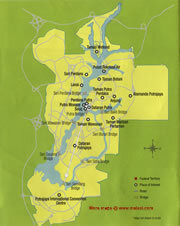 Other nearby parks include Taman Wawasan, Taman Rimba Desa, Taman Rimba Hijau and Taman Saujana Hijau. Signature Bridges When fully completed, eight unique and distinctive bridges featuring six varieties of designs-beam, arch, suspension, cable-stayed, truss and cantilever-will link the various precincts in Putrajaya. Bridges which connect to the Goverrnment Precinct serve ceremonial purposes and are decorated with regalia, flags and lighting during official state functions. Among the seven bridges which have been completed are the Putra Bridge, Seri Wawasan Bridge, Seri Gemilang Bridge, Seri Bakti Bridge, Seri Saujana Bridge, Seri Setia Bridge and Seri Bdstari Bridge. Shopping, Dining and Entertainment Visitors can shop at Souq, a bustling middle eastern-style bazaar offering a bewildering range of souvenirs, accessories, clothes, food items, or Alamanda Putrajaya, a popular one-stop shopping complex. Alternatively, visitors can also head for Anjung and Lanai where restaurants, bookshops, convenience stores, pharmacies and handicraft shops are located. A wide variety of local and international cuisine can also be sampled at various restaurants and food courts in the city. (Tel: 603-88888882). Putrajaya is located 25km from Kuala Lumpur and 20km from the modern Kuala Lumpur international Airport (KLIA)-the main gateway into the country which is served by over 45 international airlines. Getting to the city is convenient as it is well served with a comprehensive network of public transportation comprising taxi, bus as well as rapid transit services and linked to major road and railway networks.